The suggested method that is often touted as the most effective is Special Offer or Coupons… I think that it’s old and it really doesn’t work for local businesses who often work on tight margins already. Who needs more customers looking for a deal. It works for a lot of marketers, but I want you to try something different. Something that would drive QUALITY leads and I would not have to discount the service to get them. Here is an alternative to help your local business if you really DO NOT want to use discounts and coupons. Create high quality content on dedicated landing pages on for each service you provide. Then this will drive traffic looking for those services specifically. I bet you are thinking, that won’t work, who will read it and what can I write? LET ME CHALLENGE YOU! If you go to your local area and pull up your competitors in your niche. How many of them truly have Quality Content for the top just 10 services? Maybe 1 in 10 of your competitors? Then who of those shops, who ALSO has QUALITY calls to action specific to the service? Then who ALSO is running quality traffic to those pages? Maybe 1 in 50? Then you can probably guess that shop is doing well north of a million bucks a year. STEP 2 CREATE YOUR SPECIFIC SERVICE OFFERS. To create the landing pages with specific content about specific services, YOU NEED TO BE REALLY SPECIFIC. So teeth whitening Bristol, not Dentist Bristol, Timing Belt Replacement NOT Car Repairs, Replace a Boiler not Plumber. This is where you distance yourself from the competition. Create QUALITY & COMPELLING content for your top services , ideally 10. The way to do this is to think about the questions that customers have. This approach will lead readers to know YOU as the local expert for that service. Create a simple landing page for each service on your website. (Landing Pages are pages that stand alone, people can’t click a menu at the top, they are designed to get people to take action on that page). Add a call to Action on each page, see below. Now you know anyone that reads your content and fills out the form is a hot lead. Your landing page should call out the CITY, and the service. Then add the rest of your content under that, of course adding video testimonials on each page from a customer is ideal, it means a much higher conversion rate. Your call to action should have the service in the title of the call to action. Make it a call to action and form for that service specifically. Or if your a Beauty Salon, do you prefer an appointment in the morning or evening? We have discovered that companies asking that extra question, get even better qualified leads, perhaps its that tiny bit of extra commitment that makes it work. Always ask for PHONE NUMBER – If they have a need they will provide it, we know that companies get a 40% – 60% book rate off of phone leads. The option we suggest to clients however is to use a Facebook Messenger Bot that automatically pre populates the information and allows you to start having conversations within messenger, opt in rates are as High as 80%. See an example for a local business. To compare it’s less than 5 – 15% for email leads in most industries. You’re now ready to turn on the traffic to your Landing Page (its like a 24 hour salesperson that never takes a day off). Send traffic from paid adverts via social or Google, add each page to local directories and Google places (hire someone to do this), Share the pages on social, send out direct mail pieces for each service etc. Facebook ads are brilliant for local businesses because it’s so easy to really target your audience. We always recommend adding retargeting ads, that means anyone that spends time on your page, they don’t take action, we make sure your ad appears when they are online again. Now, remember if you create one funnel for Teeth Whitening, Boiler Maintenance etc and that net’s you 10 leads per month. Then each of your other 9 Funnels get you 10 leads a month, and 40% of those become customers .. what’s that worth to you? 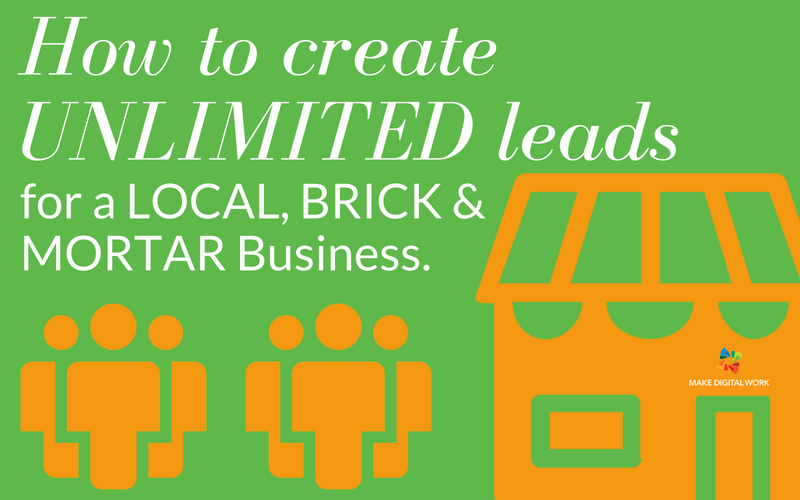 How many leads do you want your LOCAL brick and mortar business to have?